DOAC-Stop can be used to efficiently remove all types of Direct Oral Anti-Coagulants (DOACs) including dabigatran, apixaban, rivaroxaban and edoxaban, from test plasmas with minimal effect on plasma proteins involved in the clotting mechanism. DOAC-Stop can be used to identify plasmas containing DOACs using simple clotting tests. DOAC-Stop is an adsorbent product that extracts DOACs from plasmas. DOAC-Stop may extract low molecular weight compounds resembling DOACs from plasmas. Those affecting coagulation (but administered intravenously, not orally) include argatroban, aprotinin, protamine, hirudin analogues, polymyxin and related cationic compounds. 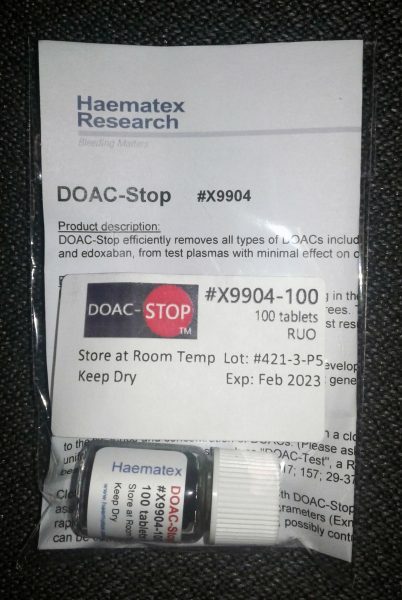 DOAC Stop is intended for use with plasma samples suspected to contain DOACs. If test results are unchanged by DOAC Stop and DOACs are still suspected to be present, apply appropriate chromogenic anti-Factor Xa or anti-Factor IIa assays to obtain specific DOAC results. Contact Diapharma for product info and technical support. Store in a dry area at room temperature. Do not use after the expiry date indicated on the label. Treat all material as potentially infectious and dispose in accordance with local operating regulations. For further information, please refer to Safety Data Sheet and Product Information. Sample preparation: DOAC-stop has been developed for use with citrated plasmas. Follow your validated laboratory procedures for preparing test plasma. Apply the citrated plasma in the procedure below to remove any DOAC if present. Add 1.0ml of citrated test plasma to be treated to a plastic centrifuge tube. Ideally 1.0ml plasma but a range from 0.5ml to 1.5ml is acceptable. Add 1 DOAC-Stop mini-tab and mix gently for 5 minutes. Centrifuge down the particulate matter. (for example, 2 minutes at 2000g). The supernatant plasma, now depleted of DOACs can be used directly for testing or can be transferred into a separate plastic tube for frozen storage. Therapeutic uses of DOACs are increasing. DOACs are known to interfere with almost all clotting tests to varying degrees. Thus, in the coagulation research laboratory, plasmas giving unexpectedly prolonged clotting time or abnormal chromogenic test results may need to be screened for the presence of DOACs. Sometimes study subjects to be tested for underlying coagulation defects may also be on DOACs. DOAC-Stop is the first general agent available for solving the interference problems associated with DOACs. After treatment with DOAC-Stop, plasma samples can be analyzed for factor deficiencies, heparin, lupus anticoagulant, or other interfering antibodies. Just add one mini-tablet per 1ml test plasma (volume is not critical), mix for 5 minutes and centrifuge down the adsorbent. The resulting plasma is then depleted of DOACs and yields similar APTT, dRVVT, PT(INR) and other results as if DOACs had not been present. May be useful for identifying if DOACs are present and also for providing DOAC free plasmas for valid testing of a range of hemostatic parameters in test plasma. It absorbs up to an estimated 2,000ng/ml of any DOAC in less than 5 minutes. Unlike therapeutic additives for reversing DOACs, it leaves no residual effect. It can be used for checking if DOACs are present in samples giving unexpectedly prolonged clotting test or abnormal chromogenic test results. There is negligible interference with vitamin K antagonist or heparinoid anticoagulants. Plasmas treated with DOAC-Stop can be used for valid factor assays and in thrombosis research.